Cash seized from the Lucas' second home in Scarsdale, New York. An Upper West Side doctor and his wife have been accused of writing more than 20,000 illegal prescriptions for oxycodone in a plot that authorities say pumped more than $77 million worth of the powerful narcotic into the black market. Rogelio Lucas and his wife, Lydia Lucas, were arrested at their home on West 95th Street and are charged with fourth-degree conspiracy and 37 drug counts, prosecutors say. 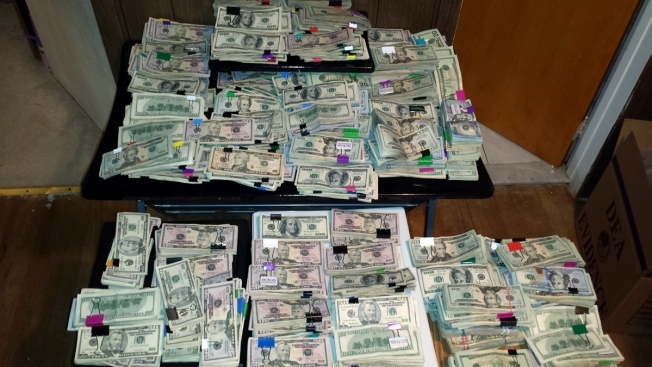 Lucas and his wife are accused of doling out 3.1 million doses of the narcotic in exchange for cash payments that were then sold by drug rings around the city over a 6 1/2-year period. Prosecutors say that until 2009, Lucas operated a family practice that catered to patients covered by Medicaid. That year, things changed, with Lucas writing prescriptions for oxycodone about 75 percent of the time. Crowds started gathering in the waiting room, prosecutors say, and Lucas relocated several times before taking up office at a building on West 101st Street. Once there, prosecutors allege, Lucas’s wife took $120 cash payments from so-called patients, who would allegedly receive prescriptions for the narcotic after a rudimentary examination. Lucas wrote more than 23,600 prescriptions for oxycodone over the course of the conspiracy. In one year alone, Lucas’ wife deposited nearly $500,000 cash into bank accounts for the practice. Prosecutors say that Lucas didn’t just prescribe to anyone who came to the clinic, however. The doctor allegedly refused to take first-time appointments with patients who hadn’t been referred by members of drug rings around the city. Once a patient was approved, they would wait for more than an hour before an examination where Lucas didn’t ask about their injuries, medical history or pain, prosecutors say. Afterward, Lucas allegedly wrote prescriptions for oxycodone, which would then be filled at local pharmacies. Prosecutors allege that the drugs were then resold on the streets. Authorities allege that several drug dealing networks around the city went to Lucas for prescriptions. After their arrest, authorities seized more than $600,000 cash from the couple’s second home in Scarsdale. Attorney information for Lucas and his wife wasn’t immediately available. Both pleaded not guilty at their arraignment Thursday. Neither has a criminal record. Lucas' arrest comes about six months after federal authorities arrested another Manhattan doctor under similar circumstances. Dr. Moshe Mirilishvili was arrested in December after authorities alleged he wrote 13,000 illegal oxycodone prescriptions.